(The book is anonymous, but Rimbault is generally accepted to have been the author.) x + 189 + 32pp., 12mo. A 32-page publisher's catalogue is bound in at the end. In publisher's blind-tooled black ribbed cloth, with gilt spine. Advertisements printed on endpapers. Tight copy on lightly-aged paper, in worn binding with damage to hinges. Ownership inscription on half-title. [ E. Rimbault Dibdin, art critic and curator. ] Five Typed Letters Signed (all 'Edwd Rimbault Dibdin') to Sir Henry Trueman Wood, Secretary, Royal Society of Arts, regarding the Liverpool artists Richard Wright, Peter Perez Burdett and William Tate. The five on letterheads of the Walker Art Gallery, City of Liverpool, and dating between 27 November 1915 and 23 February 1916. The letters total 5pp., 4to; and 1p., 12mo. In good condition, on lightly-aged paper. With stamps of the Royal Society of Arts. On the reverse of one letter are pencil notes, presumably by Wood. [ Austin Brereton, drama critic. ] Typed Letter Signed to fellow-critic E. R. Dibdin, asking to borrow playbills to assist in the writing of his biography of Sir Henry Irving. 26 Suffolk Street, Pall Mall, London SW. 17 February 1908. 1p., 4to. In good condition, lightly-aged. Having been informed by another critic, William Archer, that Dibdin possesses 'some playbills of Irving's appearances in Edinburgh in the early days', he asks to borrow them for a week or so, as he iss 'writing the authoritative Lifef of the actor, and although I have a vast amount of material, I do not want to let anything slip'. He requests a prompt response, as he is 'sending my first volume to the printers early in March'. 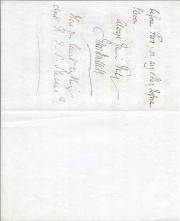 Autograph Letter Signed ('John Hullah') from the English composer John Pyke Hullah to the organist Edward Francis Rimbault. 30 March 1868; on letterhead of 11 Devonshire Place, W., London. 12mo, 2 pp. Bifolium. 12 lines. Text clear and complete. Good, on lightly-aged paper. He would 'much like' to show him a song he has written for 'Exeter Hall', and proposes dinner the following day. In a postscript asks if he has 'learnt anything about R. J. S. Stevens'.